Check out Giuseppe’s Open 7400 competition entry. It’s a 1 bit microprocessor based on the MC14500 CMOS chip. 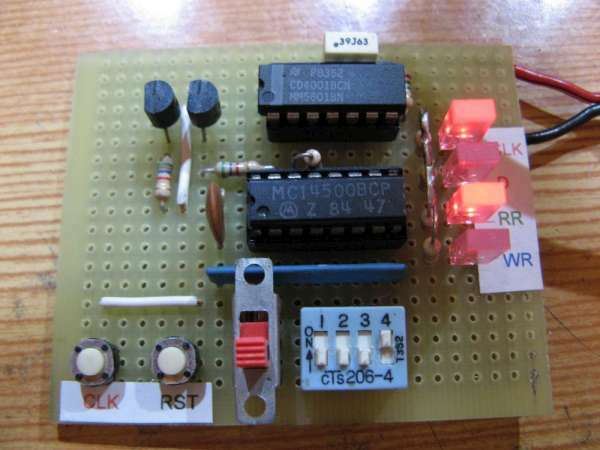 This circuit is based on the CMOS chip MC14500. This chip is an ICU (industrial control unit) built from Motorola few years ago, it is a 1 bit processor that can do some logical operations. This chip is now discontinued but can be found on ebay and other sites. My circuit probably doesn’t have an application in real world, but can be useful for didactic purposes, to learn how a simple microprocessor works. This entry was posted on Wednesday, October 31st, 2012 at 9:00 pm	and is filed under 7400 contest, contest. You can follow any responses to this entry through the RSS 2.0 feed. You can skip to the end and leave a response. Pinging is currently not allowed. So he uses a 14500 and a 4001. How does that fit into a 7400 (TTL!) competition? Any electronic circuit can be entered, but judges will favor designs where discrete logic chips are a major component. All discrete logic families are acceptable, including 7400, 4000, etc.